Home Blog Have a Gory Halloween! With just over 3 months to go, it’s the perfect time to start your Halloween preparations! Whether you’re hosting your own spooky party or just looking to update your scary décor, we have tonnes of freaky decorations here at Halloween Horror Shop that will help to make your Halloween the best yet! Why not make your Halloween theme a gory one this year? With the rising popularity of gory, zombie films and TV programmes such as The Walking Dead why not turn a theme like this into your seasonal decoration this Halloween? In this short blog we want to give you a peek at some of the fantastic products on our Halloween Horror Shop that will help you complete your gory décor scheme! Our website is live all year round and we have lots of fantastic Halloween Props that are guaranteed to give your party guests and trick or treaters a fright! Our Zombie Woman Eating Victim Decoration that we’re sure will scare the living daylights out of your guests! This decoration has fantastic detailing with realistic hair, nails and teeth, and is made from moulded rubber and hand finished for great quality. It includes scary red LED lights making it even more terrifying at night time! Another fantastic decoration to add to any party or home décor is our Zombie Bride with Alien Baby out of Stomach. This will instantly create a terrifying atmosphere and is sure to be the talking point of your Halloween party this year! It is animated and sound activated so is sure to make your guests jump. It also emits a spooky wailing sound, just another way to keep the freaky atmosphere in your Halloween venue. Our Gruesome Crawling Torso is another of our animated Halloween Props that looks especially terrifying at night. It has realistic detailing as seen in the image below, making it a spook-tacular addition to any room or venue! Tuck it away behind a curtain or amongst other decorations to give your guests a real surprise when they see it come out of nowhere! Here’s a unique decoration for you to try this year, our Spooky Toilet with a Gory Zombie Head Popping Out really will be the focal point of your Halloween party! This spooky toilet creates an instantly terrifying atmosphere, as the toilet flushes, a gory zombie head appears from beneath the lid! The zombie has bright red LED eyes and makes a deathly laughing noise, making it extra scary at night, ticking all the boxes for a frightening decorative piece! Check out our Gruesome Sitting Ghoul! She’s scarily realistic and will frighten the life out of your guests! Simply sit her on a wall or chair and prepare for a scare! This decoration is superb quality with gory blood detailing, ideal for any Halloween display or party especially if you’re going to go with this gory theme! Thinking about creating your own gory Halloween costume? We have lots of great Fancy Dress Accessories that will help you to make your freakiest outfit yet! Whether you’re going for a zombie, vampire or something more specific, check out our Fancy Dress section where we can help you to finish it off! Why not add our Bloody Bandage to your costume? Perfect for adding some gore, this bandage is over 7m long, so plenty to wrap around yourself. Or why not add some classic fake blood to your shop, like our Zombie Blood Spray? Ideal for use on your face, clothes or décor, creating realistic effects, and is easily washed with soapy water. 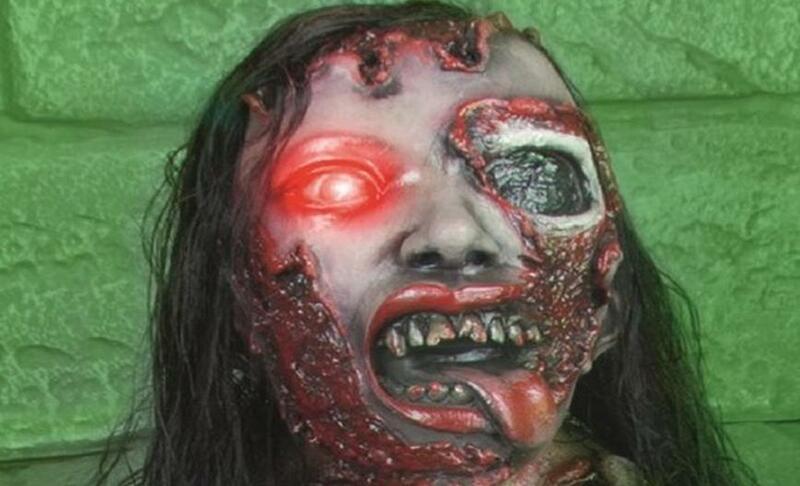 This will definitely add some wow factor to your gory costume this Halloween! We hope this has given you a little inspiration if you’re considering a gory Halloween theme like this. Head to our Halloween Horror Shop website to check out all these fantastic products and many more, helping you make your Halloween the spookiest yet!